After spending over 5 great years at IBM, I’ve started a new job at Endeca. The bad news is that I’m currently computerless – the machine I ordered a month ago isn’t scheduled to be delivered for another two months. Unfortunately this means for now photo-processing (and recipe-posting) is on hold indefinitely while I try to figure out whether to get something else in the meantime. As I was biking along the Esplanade this evening, I caught a glimpse of a mother mallard duck watching over her four children. 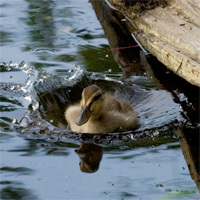 I imagine they are well on their way to adulthood; they were much larger than some ducklings I saw a few weeks ago. Luckily I had my 70-200mm lens. The mother watched me suspiciously as I moved around and took a few photos. It’ll probably be a few weeks before I post the rest of the pictures, but I like this one so much that it’s going up immediately. I have spent most of my volunteering hours working with students; as the son of an educator, I cringe when I hear about how poorly the US does on math and science tests (which, unfortunately, is quite often). After working for several years with Boston Latin Academy in an event-coordinator role, I was interested in finding something inside the classroom just to get a glimpse of what it was like. It was hard. There is no doubt that the students we had were very bright, but getting them to focus was quite difficult. We constantly questioned our ability to teach them effectively. We worried about losing control of the class, which was usually on the brink of chaos. On some Mondays the thought alone of facing them made us exhausted. And we were only doing this 90 minutes a week with a small class, getting to the school around 230pm, not waking up every weekday at the crack of dawn to teach for several hours. Teachers most certainly deserve that summer break of theirs. Of course, the challenges made the rewards all the sweeter. We savored the times when students volunteered to answer questions, showed off accomplishments to us and to each other, and worked together to solve problems. They really hit their stride towards the end of the class, when every session was spent adding new functionality to their video games. We were happy to see them perform spectacularly at the end-of-term events, where they explained the inner workings of their code to friends, teachers, and strangers. One of the things that I’ve realized is that it is incredibly easy to make excuses for everyone, especially the students. This one is having a tough time at home, that one had a rough day at school, this other one didn’t really want to be put in this class in the first place. It has the potential to be a huge demotivator for the teacher – at times it can seem too hard to overcome the baggage that the students are dragging around. But regardless of what was going on, I came to realize that we had those students for 90 minutes a week, and no matter what was going on in their lives it was our duty to try our hardest to teach them something. I imagine that it takes an incredible amount of willpower and energy to do this full-time, and I definitely appreciate more the teachers that I have learned from. Overall I think that the Citizen Schools program is a very good one. Aside from teaching students how to behave properly be encouraging the demonstration of certain core values, it also addresses two problems of education: the disconnect between concepts learned in class and their application to real world problems as well as the one between a classroom and its local community. Bridging these gaps will give students interesting problems to think about and also make students aware of local career opportunities. In theory it should make their classroom studies more relevant to the world outside, and hopefully more interesting to them. 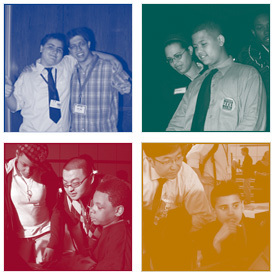 We have met several passionate educators (who have become good friends) – Emmanuel Schanzer, who developed the Boostrap curriculum; Alex Stryker and Kevin Ingram, who helped us maintain order in our classroom; Chris Conroy, who scrambled every week to make sure our classroom was equipped with everything we needed; and Brent Holsinger, who also provided a lot of support. Everyone gave us a lot of valuable advice and feedback, and it was great to have so much help. I am a big fan of broiled salmon (especially this recipe). A few weeks ago I had some extra dill lying around so I combined 4 tablespoons of fresh dill with 1 minced garlic clove and 1/4 teaspoon of salt in 1/2 cup of olive oil. I rubbed the mixture onto two pounds of salmon fillets and stuck it under the broiler. After about 10 minutes I started checking for doneness (start checking earlier if your fillets are on the thin side). 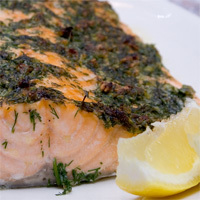 The salmon was served with lemon wedges; the dill and lemon go well together. After a long wait, Planet Puzzle League (Panel de Pon, Tetris Attack, Pokemon Puzzle) is finally out. I picked it up (two copies) about a week ago, and I love it so far. Feels a bit strange to be getting so much enjoyment out of a game I’ve played so many times before. + Touch screen control is awesome. No more frantically moving the cursor up and down with the D-pad. Just for kicks I tried playing it with the D-pad this evening and it felt really sluggish. + Online play. Would have liked Tetris DS-style rankings, but this is good enough. Will probably be playing with people I know for the most part. When playing against friends you have the option of turning voice chat on. + It’s the same core gameplay.There’s a great mixture of well-planned attacks, on-demand chaining, and frantically searching for a single match. I think that the best play mechanic is being able to continue to manipulate the game board as a chain propagates (unlike in Puzzle Fighter, Puyo Pop, Bust a Move, etc.). Powerful special items have been added to make the game a lot more interesting and unpredictable, giving you new ways to screw with your opponents. Meteos-style skins and music. Very reminiscent of this other DS puzzler. Not sure if I like it since I always use red hearts, green squares, yellow stars, blue triangles, and purple diamonds. – No avatars. I truly miss the Tetris Attack animals and the Pokemon from previous incarnations of this game, especially the sounds that thye made. I also kind of liked the 1P mode of battling different opponents. – No easy way to refer to the game.“Tetris Attack” and “Pokemon Puzzle” were good names. “Planet Puzzle League” is not, and “PPL” is confusing to people. At a charity auction in the fall, one of Jen’s core teammates won a dinner & Wii party hosted by us. His love of chocolate imposed the only real restriction on the menu: the dessert had to have chocolate, and a lot of it. Feeling ambitious after successfully tackling the Strawberry Cream Cake, I decided to give this chocolate cake a try. It is excellent with vanilla ice cream and/or a glass of milk. And the tip about bringing refrigerated cake to room temperature is a good one – it tastes much better if you leave it out for a bit first. Do not substitute semisweet chocolate chips for the chopped semisweet chocolate in the frosting—chocolate chips contain less cocoa butter than bar chocolate and will not melt as readily. For best results, don’t make the frosting until the cakes are cooled, and use the frosting as soon as it is ready. If the frosting gets too cold and stiff to spread easily, wrap the mixer bowl with a towel soaked in hot water and mix on low speed until the frosting appears creamy and smooth. 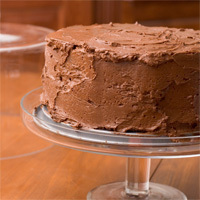 Refrigerated leftover cake should sit at room temperature before serving until the frosting softens. 4. For the frosting: Melt chocolate in heatproof bowl set over saucepan containing 1 inch of barely simmering water, stirring occasionally until smooth. Remove from heat and set aside. Meanwhile, heat butter in small saucepan over medium-low heat until melted. Increase heat to medium; add sugar, corn syrup, vanilla, and salt and stir with heatproof rubber spatula until sugar is dissolved, 4 to 5 minutes. Add melted chocolate, butter mixture, and cream to clean bowl of standing mixer and stir to thoroughly combine. 6. Frosting the cake: Place one cake layer on serving platter or cardboard round. Spread 1 1/2 cups frosting evenly across top of cake with spatula. Place second cake layer on top, then spread remaining frosting evenly over top and sides of cake. Cut into slices and serve. When Jen’s classmate offered to let me borrow his Canon 100-400mm f/4.6-5.6L ISLens, there was no way I was going to turn him down. Within a day or so I took my first trip down to the Charles River. 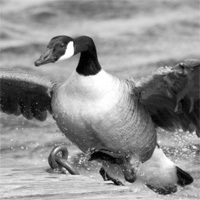 I came across a pair of geese that arrived at our lunch dock and made their way up to the park. It’s been a lot of fun to shoot with this lens, as 400mm stretches a long way. It is quite heavy and large. The image stabilization helps to smooth out some of the motion when handholding, but having additional support probably goes a long way towards getting sharper images. The lens zooms as you extend the tube outwards. It took me quite a while to figure out how this mechanism worked, but eventually I discovered the tension ring and twisted it in the “smooth” direction to loosen it, allowing the lens to extend. During the summer I’m especially interested in finding recipes for cold dishes for grill nights and picnics. I paired this with some grilled tuna. It’s got a very nice, light flavor to it. To prepare the cucumbers, cut them in half, scoop the seeds out with a spoon, slice into 1/4 inch pieces, and toss with 1 teaspoon of salt per cucumber in a colander. Press by placing a gallon-sized Ziplock bag filled with water on top of the cucumbers (I used two smaller bags and placed my dutch oven lid on top. Let the salted cucumbers drain, weighted, in the colander for at least 1 hour and up to 3 hours. Whisk all of the ingredients except the cucumbers in a medium bowl. 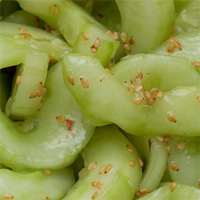 Add the drained cucumbers; toss to coat. Serve chilled or at room temperature.